March 1, 2013: Something unexpected is happening on the sun. 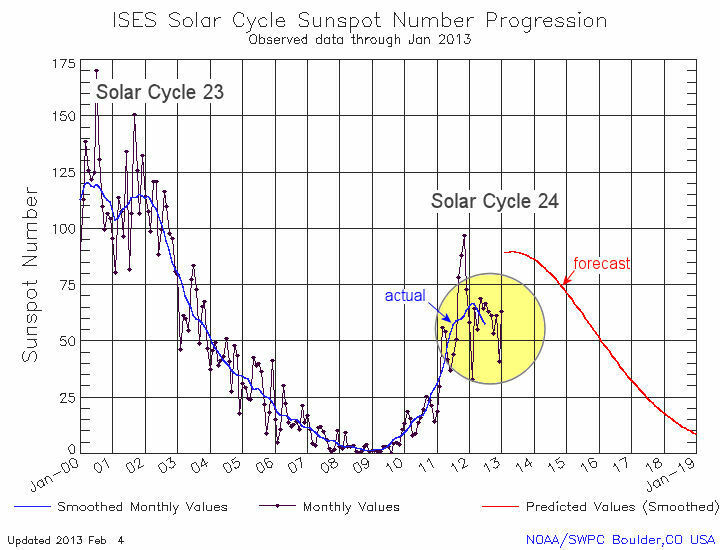 2013 is supposed to be the year of Solar Max, the peak of the 11-year sunspot cycle. Yet 2013 has arrived and solar activity is relatively low. Sunspot numbers are well below their values in 2011, and strong solar flares have been infrequent for many months. Pesnell notes yet another complication: "The last two solar maxima, around 1989 and 2001, had not one but two peaks." Solar activity went up, dipped, then resumed, performing a mini-cycle that lasted about two years. The same thing could be happening now. 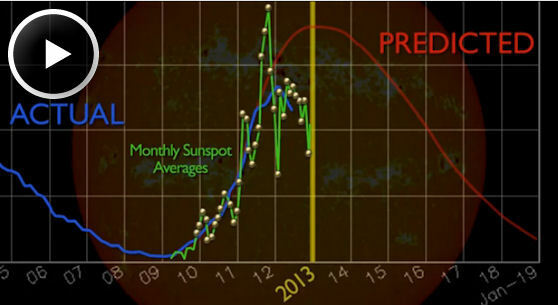 Sunspot counts jumped in 2011, dipped in 2012, and Pesnell expects them to rebound again in 2013: "I am comfortable in saying that another peak will happen in 2013 and possibly last into 2014," he predicts. 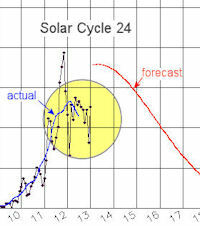 "The Solar Cycle 24 Prediction Panel has reached a consensus. The panel has decided that the next solar cycle (Cycle 24) will be below average in intensity, with a maximum sunspot number of 90. Given the date of solar minimum and the predicted maximum intensity, solar maximum is now expected to occur in May 2013. Note, this is not a unanimous decision, but a supermajority of the panel did agree." No one knows for sure what the sun will do next. It seems likely, though, that the end of 2013 could be a lot livelier than the beginning.